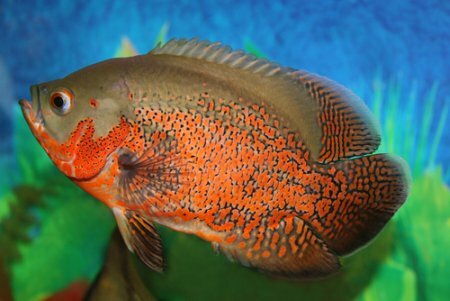 Oscars belong to Cichlid family of fish, they are one of the most well known Cichlids. Some people would say they are infamous in the fish keeping world, they have a reputation as being one of the more troublesome fish available. Despite this they remain a very popular fish. Oscars originate from South America, particularly the Amazon and Orinoco drainage system. In the wild they compete with other predatory fish such as piranha and giant catfish in order to find food. Scientists believe this is why Oscars are so intelligent, they had to become clever in order to catch food and survive. Through selective breeding these fish now exist in a range of colours and patterns. Even in the wild variety there was quite a lot colour and pattern variation between different specimens, this has made selective breeding easier. One of the most popular of the new styles is the Tiger Oscar, it is very similar to the wild variety it just has a bit more red colouration. Other strains include the Red Oscar and the Albino. The first thing to consider when thinking buying one of these fish is how big they grow. They grow surprisingly fast. Many people buy them as small juveniles and quite quickly end up with a fish which is too big for their tank. I have owned Oscars in the past and can confirm that they grow fast and eat everything. In the long term a tank of 150 gallons or above is advisable. Because they eat a lot they produce a lot of waste. If you have a good filter and you are willing to spend a lot of time cleaning the tank, then you can manage with a slightly smaller tank. Due to their aggressive behaviour and size plants and other aquarium decorations are not a good idea. These fish have been known to attack plants and aquarium equipment such as filters. They often like to move gravel, sand and small rocks around their tank. Large bits of driftwood and rock can be used to stop the tank looking bare. As mentioned above these fish produce a lot of waste, so a powerful filter is needed. Given their aggressive behaviour try to get a filter which has a good sturdy design. Oscars will consider most other fish as food, especially small fish such as guppies and tetras. Other Cichlids are not a good choice either, many other large cichlids are more aggressive and will harass an Oscar. You see they are not bullies, they are just always hungry. A good choice for tank mate would be a Plecostomus or more commonly known as Plecos. Plecos have armored bodies, which means they will not get eaten. Their natural diet is other fish. Some Oscar keepers only feed them live fish, such as guppies and goldfish. It is a personal choice if you to feed your live food or not. Some people think it is morally wrong. My Oscar did eat some its tank mates. I did not buy the other fish for it to eat I was fairly to new to the hobby and a little naive regarding what they eat. If you don’t like the idea of live fish as food, that’s fine, but you need to feed your fish alternative food from the start. You can also feed them dry fish food. When they get bigger you can swap from flake food to pellets. Mealworms and earthworms are also acceptable. As discussed so far these fish can be aggressive, destructive and predatory. So you may be wondering why anyone would want one. Cichlids in general are more intelligent than other fish. They tend to interact more with their owner as well. An Oscar is perhaps the most intelligent of freshwater fish and each one has its own unique personality. Like a dog, you can teach these fish simple tricks. It will take a lot of time and effort to train them, but it can be done. Like you would a dog you reward the fish’s progress with food, as you already know these fish love their food. Some owners are even able to pet their fish.